It has become an annual fixture in my diary now, to have a lunch and tasting in Glasgow with the effervescent Jane Wilson (right), winemaker with Lowe wines of Mudgee, Australia (see also a report from 2003). 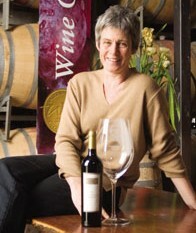 For seven or eight years in a row Jane has come back to her native Scotland to present a series of wine lunches, dinners and tastings, helping to grow the Scottish distribution of her superb wines, particularly in the restaurant sector where her wines feature on many of the nation’s top wine lists. As well as giving me a chance to taste through some of her latest releases, Jane told me that she had scaled back her very large contract winemaking operation, to concentrate more and more on her estate wines, and indeed to find a little ‘work life balance’, making time to enjoy some of her other interests, particularly her love of art. “It was the tail wagging the dog,” she tells me. Jane’s drive for sustainability is now extending into organic livestock farming, producing high grade pork from old breeds that she currently sells to Sydney restaurants, with one eye to having an organic shop and or restaurant at the winery in the future. Lowe Family wines can be purchased in many restaurants around Scotland and from their UK importer l’Art du Vin, via their website at www.aduv.co.uk.